There’s no longer much dispute among environmental toxicologists or medical experts about the potential impact of pesticides on human development. Asthma, certain types of cancers, birth defects, reproductive and neuro-developmental problems (all of which are on the rise) have all been associated with exposure to these chemicals. Children and women who are pregnant are particularly vulnerable. Pesticides are also potentially harmful to pets, who roll in the grass and groom themselves by licking their paws and fur. 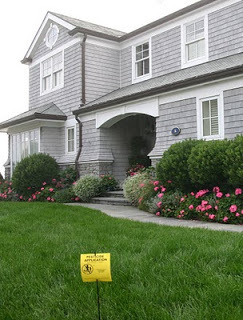 A National Cancer Institute study showed that dogs whose owners treated their lawns with 2,4-D herbicide (usually the “weed” part of those popular “weed-and-feed” products) were twice as likely to contract canine lymphoma. "Natural" or "organic" lawn care is the fastest growing segment of the green industry, and we're proud of the role Grassroots has played in helping to make that happen through our professional education seminars, our informational videos, our consumer flyers and our ever-popular "green lawn cards." But obviously we've got a long way to go. Happy Spring to all our Grassroots friends!